I love this. 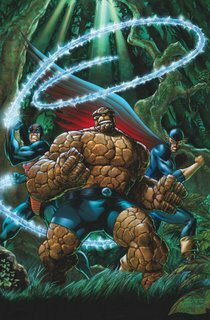 It would be impossible to write a review of a Dan Slott comic and not include the word “fun.” The thing is, The Thing is not just fun; it’s old-school Marvel fun, and that’s some of the best kind of fun to be had. Dan Slott, Andrea DiVito, and Laura Villari all deserve medals—or at least gold-plated No-Prizes—for setting the ever-lovin’-blued-eyed Thing on the road to reclaiming his former glory. Next to Spider Man (and before Wolverine was, well…Wolverine), the Thing was Marvel’s most iconic character. 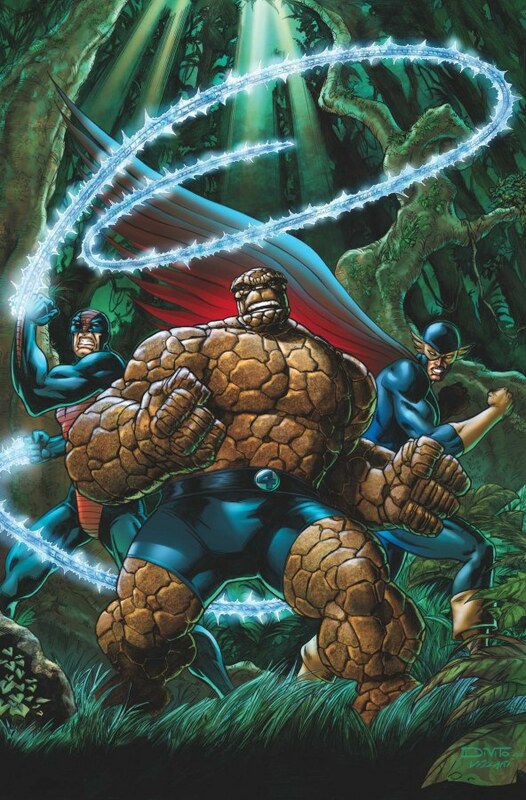 And for someone like me who grew up on the Thomas/Wein/Perez/Sinnott Fantastic Four of the late 1970s, the Thing nearly eclipsed Spider Man as an emblem of the bittersweet comedy and melodrama at which Marvel excelled. Slott, DiVito, and Villari recapture and update the atmosphere of 1970s Marvel in their snazzy new Thing series, which takes as its starting point Ben’s recent financial windfall and celebrity status. 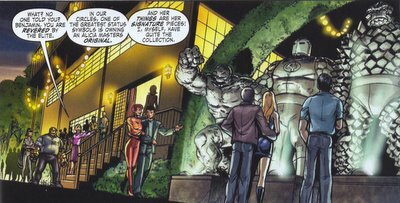 Like the 70s Marvel comics it self-consciously evokes, the series emphasizes continuity through the use of relatively obscure or neglected characters like Goliath, Nighthawk, Constrictor, and Brynocki, through references to the Thing’s (not to mention the Hulk’s) long history of mutation (in a sculpture-garden courtesy of Alicia Masters), and through the allusive “attractions” of Arcade’s Murderland theme park (which include nods to Magneto’s old sea castle and that cosmic serpent from Simonson’s Thor), etc. And what about that Andrea DiVito? 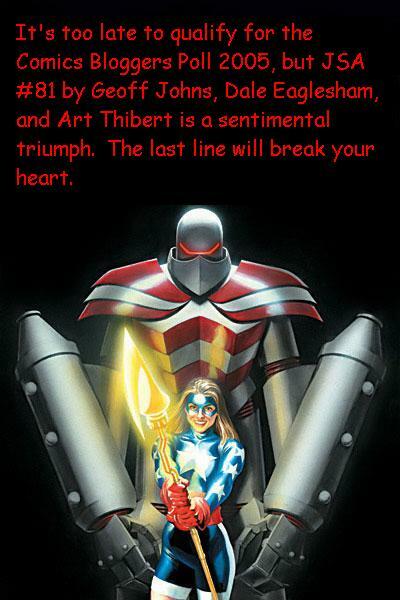 Quite some time ago, back when DiVito was drawing for CrossGen, someone there (Chuck Dixon? Barbara Kesel? Mark Alessi?) 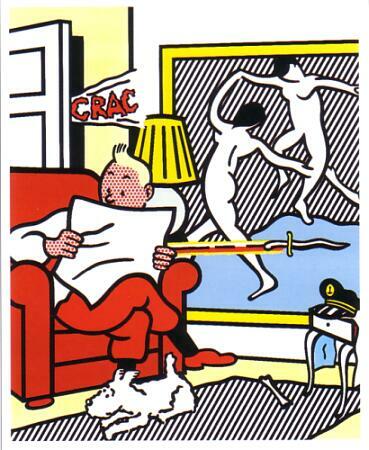 predicted that DiVito would one day ascend to the ranks of the Wizard “Hot Ten” Artists. That day may not be far off, if it isn’t here already. 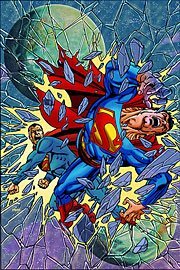 He is the perfect choice of artist for this book and here’s why: he marries the styles of two of the all time great FF artists from the late 70s and early 80s, George Perez and the early-mid John Byrne. Like Perez, DiVito has a thing for realistic anatomy and obsessive fine detailing; but like Byrne, his figures also tend to be somewhat elongated and cartoony. The combination is wonderful—my eyes actually remember looking at the Thing and his environs with exactly this sort of appreciation for depth, detail, and dynamism all those years ago. This is one of those great times where an artist’s style superbly complements the writer’s sensibility and actually contributes in a very profound way to evoking a particular time (Tom Scioli on GODLAND is the other example that springs to mind). 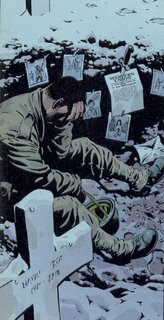 knowing that there were so many cemeteries/graves in France and Belgium, etc., due to the mind-numbing slaughter that was World War One, I always had a nagging idea for an opening scene for a movie in my mind of a group of American soldiers at the start of the Battle of The Bulge in World War Two dug in amidst the graves of a World War One cemetery about to repel a German attack. 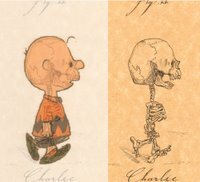 So I wrote the scene, shattered graves and all, and the horror of the old bones being disturbed by exploding shells and the soldiers facing the skulls of young soldiers kind of got me into a weird mode. Before I knew it, I had undead Germans taking on American GI’s. I said to myself: “Now there’s a combo of genres ya don’t see every day.” And the other story elements then fell into place once I allowed myself to write a War/Horror story. As long as he sticks to the American soldiers, Tomasi succeeds in building an engaging, emotionally textured narrative; when he turns his attention to the undead German army and the homicidal Angelic Hosts, however, things go awry. With typical precision and economy, Paul O’Brien sums up everything that is wrong with this book when he lambastes its ham-fisted treatment of Christianity and scorns the script’s “chronically simplistic attempt to explain why nasty things happen in a loving God’s universe, and the way it ends up trying to blame the failings of humanity on the nasty magic thingies.” The story aims for Weird War Tale profundity, but settles for a Sunday School homily about faith that would not be out of place on the curriculum of a conservative religious high school. I agree with O’Brien that “The appeal of most religious mythology is that it resonates with wider themes and therefore can still have some resonance for audiences who don’t accept the underlying religion.” I took a chance on Light Brigade (a book I’d never heard of before) in anticipation of some such “resonance.” I was disappointed that it didn’t deliver. In the end, though, what disappointed me most about this book was not the banality of its religious narrative per se, but the ill-fit between its religious framework and the genre of wartime fiction to which it owes such a significant debt. The best war fiction forces us to confront the absurdity of war and invites us to examine the categories and assumptions from which wars and war-cultures spring. Despite their many differences, war novels like Slaughterhouse-Five by Kurt Vonnegut, The Wars by Timothy Findley, The Things They Carried by Tim O’Brien, and Time’s Arrow by Marin Amis all do this, and they do it precisely by showing the places where traditional systems of morality and commonplace assumptions about the righteousness of one’s own position break down or become fatal. How frustrating, then, when a comic with as much potential as Light Brigade betrays the complexity of its source material and ends up simply rehashing Crusader pieties. Ragnell has been saying some very nice things about this blog of late and I’m happy to have the chance to return the favor. 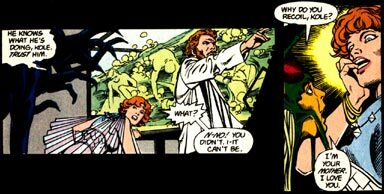 In a recent post at the witty, addictive Written World entitled On Persephone, Ragnell provides a great feminist reading of the Persephone of myth and goes on to riff insightfully on the Persephones of the DCU—they’re not who you might expect. I’ve also really enjoyed her installments of Favorite Women of DC Comics: Part 1, Part 2, Part 3, and Part 4. In fact, I enjoy Written World so much that I can almost forgive Ragnell for this brutal post. Almost. Say what you like about Judd Winick. Green Arrow is fun. 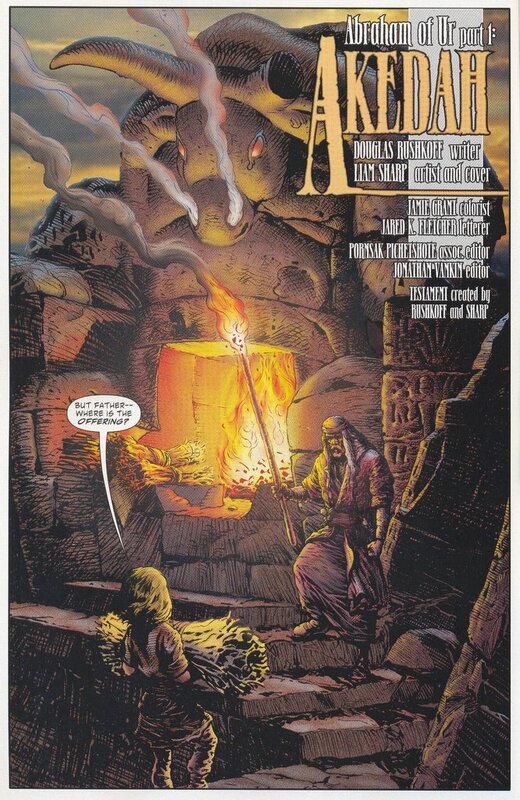 And now that Ron Garney is on pencils, it is the perfect popcorn comic. 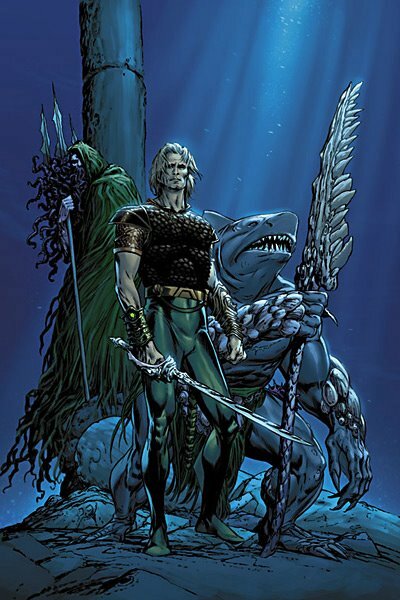 No matter what wonderful things await in my Wednesday pile, the week Green Arrow comes out, I read it first. Wha—huh? Yes, that’s right. First. There isn’t much to it, I’ll admit. The last five issues or so have pretty much been an all-action-no-subplot-cat-and-mouse skirmish between our heroes and Dr. Light with an enjoyable Black Lightening guest-spot thrown in. It’s straight ahead action and a quick read—and that’s what I like about it. Ron Garney and Bill Reinhold are the ideal art team for this breezy, exciting nail-biter: Garney’s pencils are bold and loose at the same time, and inked by Reinhold in a way that enhances their dynamism. Not enough comic artists really achieve this—the figures pop off the page, possessing genuine weight and motion. The adrenaline rush Garney’s pencils convey has a lot to do with the balance he achieves between weight and motion. There’s a kind of restrained freedom to his drawing that reminds me of John Romita Jr.’s or Sal Buscema’s or Ron Wagner’s, whose work I admire for the same reasons. 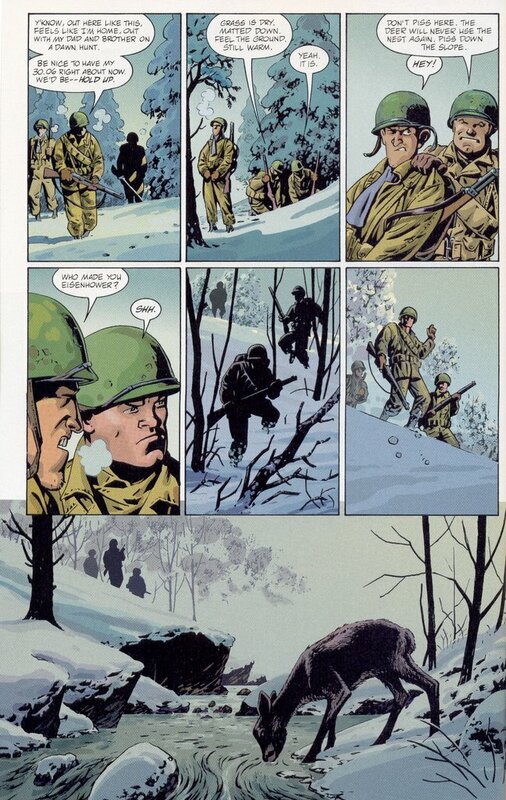 Garney’s dynamic panel construction is another reason for the book’s visual excitement. He loves drawing things from below, and cutting back and forth between high and low angles, often in rapid succession. 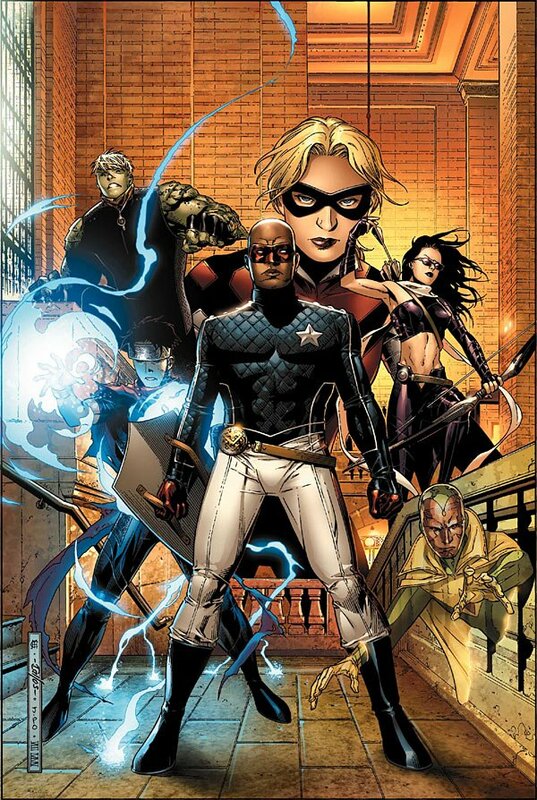 For all these reasons, the splash of Black Lightening cutting loose (#55, p. 15) actually feels electrifying; Ollie’s nasty bargaining with Killer Frost feels brutal and intense (#55, p. 21) ; the splash of Dr. Light on the rooftop across from the school amid the falling autumn leaves (#56, p. 3) is all power and arrogance; and the two-pager of Light stopping Connor and Mia’s arrows in mid air (#57, pp. 2-3) thrills. And those James Jean covers. Oh my. These are an integral element of Green Arrow’s popcorn perfection—as important in their way as the story and the interior art. They are what catapult this book into the realm of great trash. 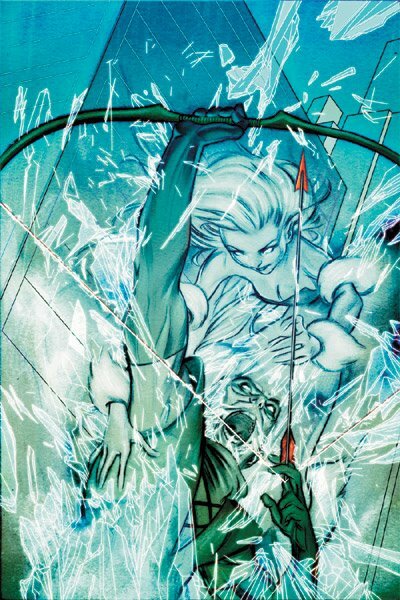 Green Arrow: the perfect consumable. 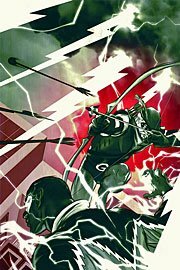 Just as commercials for McDonald’s bear little relation to the “burger” you actually eat, James Jean’s covers for Green Arrow bear little relation to the comic you actually read. They are sublime in a way that the story and art inside (much as I like it) is not. I don’t mean to imply that the comic is the visual equivalent of a Big Mac or that I am somehow being “tricked” into buying GA by Jean’s mesmerizing covers. I’m not “tricked” by Jean’s beautiful covers any more (or less) than I am “tricked” by the simulation of burger-ness in a McDonald’s ad. My point is just that the combination of Jean’s exquisite covers with the bone-crunching superheroics of Winnick and Garney’s winning spandex yarn captures something elemental about the pleasure of consumption for its own sake—something for which McDonald’s has become a sort of cultural shorthand. Okay, okay. Maybe I am comparing Green Arrow to a Big Mac. The point is, against my better judgment, I’m lovin’ it. Well, this is interesting. Media theorist and disinformation provocateur Douglas Rushkoff is writing a media virus—er, comic book. 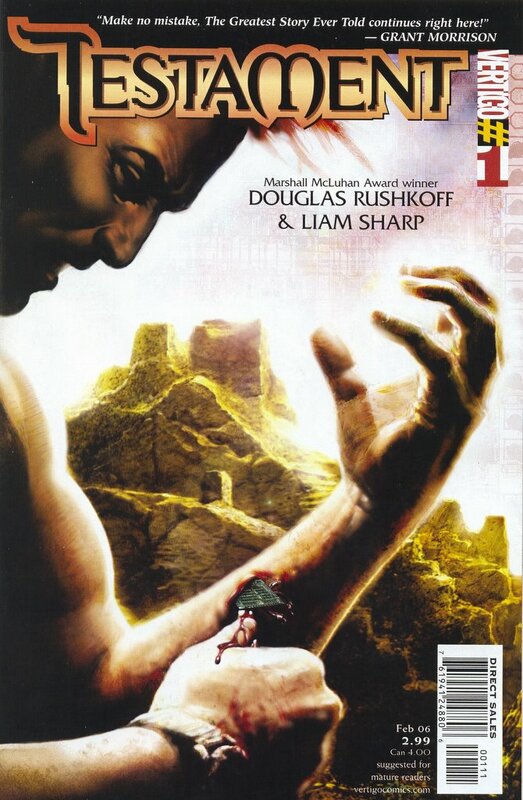 The cover of Testament #1 markets Rushkoff as the cybernetic lovechild of Grant Morrison and Marshall McLuhan—how could I possibly resist? Ellis: Would you say that part of your reason for telling this story is to show that the bible has merit? That despite the fanatics and inaccuracies and insanity that the stories themselves can still be important? Rushkoff: For sure. The people who seem to have a monopoly on the Bible right now are basically insane. Truly. They’re nuts, and believe really outrageous things about creation and judgment. Even our President believes this really bizarre stuff – on the order of Santa Claus myths, but dark and damning. The problem is when we surrender the most potent mythology developed this side of the Euphrates to those folks. Sure, we still have our Star Wars and Matrix, but the Bible was written over many centuries, and holds open the door to a myriad of valuable mysteries. I just hated the idea that the tools in there would be lost to our generation and generations to follow. So many big answers have been worked out, it’s be foolish to have to start over. And if kids are willing to read Crowley and Blavatsky and the Upanishads, they really should have access to these stories, as well. Ellis: Do you feel it more pressing to explain this to those who dismiss it outright or those who praise it yet miss the point completely? 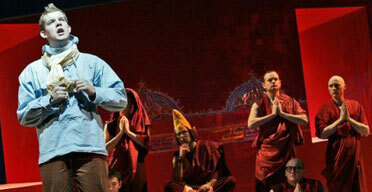 Rushkoff: Those who praise it yet miss the point are a lot harder to reach. They’re looking for the Bible to serve as an idol – and it turns out it’s been written well enough to answer this need, too. It’s really working on two levels at once – as any great writer attempts to. One is for the people who need to have their beliefs confirmed, and the other is for the people who are willing to have them smashed wide open. The best writing – and I think Bible was once capable of doing this – speaks to that first group in such a way as to slowly bring them to their senses. It strokes with one hand while taking away false beliefs with the other. The problem is that the Bible was written so long ago that people no longer recognize what’s allegory and what’s history. The first hearers of Torah got the jokes, and saw the symbolism. People today would need to learn a whole lot of history to distinguish all the references. They may as well be reading Finnegan’s Wake. As someone whose first exposure to the Bible was as an adult, in a course called “The Bible and Literature” (for “and” read “as”), and whose only (marginal) interest in the Bible is literary and ethical/philosophical, I am both intrigued by and ambivalent about Rushkoff’s project. I’d be delighted if people started reading the Bible as “a handbook for psychic revolt” (as he calls it in his “On the Ledge” guest-column in this month’s Vertigo books)—and no doubt, some already do. I also love Rushkoff’s observation that “The best writing – and I think Bible was once capable of doing this – …strokes with one hand while taking away false beliefs with the other.” But this is, to say the least, an extremely optimistic view about the liberating possibilities of religious texts on a mass scale. In practice, things rarely work out so well. What’s more, as necessary as it is, I’m always a little skeptical about the impulse to reclaim religious texts. To Rushkoff’s concern that it is problematic “when we surrender the most potent mythology developed this side of the Euphrates to [religious fundamentalists],” I am tempted to say: sure, but what about the other side of the Euphrates? Why salvage this mythology in particular? I share Rushkoff’s desire to make the most of this bizarre and fascinating document known as the Bible—why not? It’s a great opportunity to affect reality in a positive way. But the choice of texts to work with always has costs as well as gains, and in the case of sacred texts, these costs involve as much of a closing off, culturally speaking, as an opening out. This is why I’m so enamored with Morrison’s superheroes: they seem to offer the possibility of a new mythology that is less culturally rooted and potentially divisive—though I admit that, even in this case, given their inevitably American (or at least “Western”) origins, the Morrisonian vision of a new (polymorphous) mythology is arguably chimeral as well. 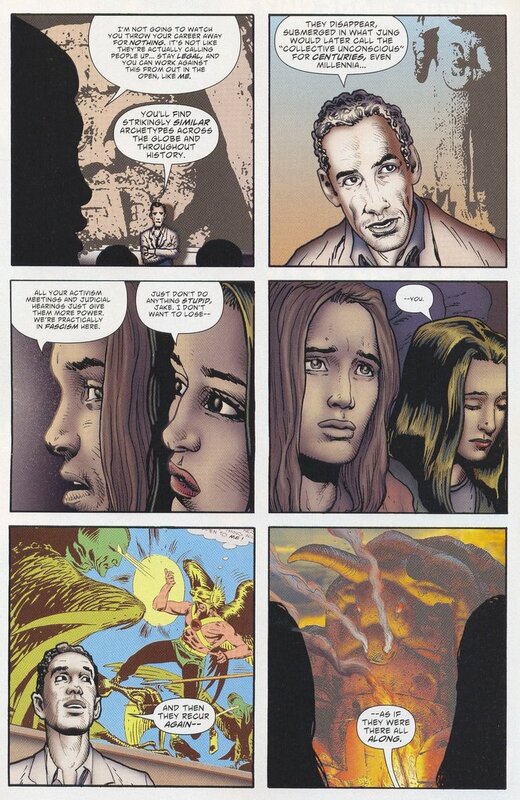 There’s also a curious moment in Testament #1 when Rushkoff himself makes a cameo appearance as a university professor lecturing to the characters about the global-historical recurrence of archetypes that “disappear, submerged in what Jung would call the ‘collective unconscious’ for centuries, even millennia” only to “recur again [in a Hawkman comic!] 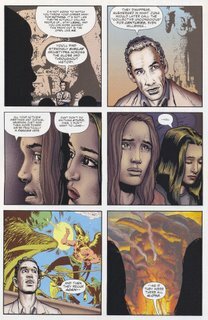 as if they were there all along.” This is Rushkoff announcing the premise of his comic book, the first issue of which essentially recreates the Abraham and Isaac story in a dystopian future-present America. But it also hints at Rushkoff’s ambiguous (incoherent?) marriage of eternal, ahistorical myth (Jung’s collective unconscious) with counter cultural rebellion and “open source” politics (“reality is an open source proposition, and up for modification”). One is tempted to ask: which is it? The eternal, the ahistorical, the mythic? 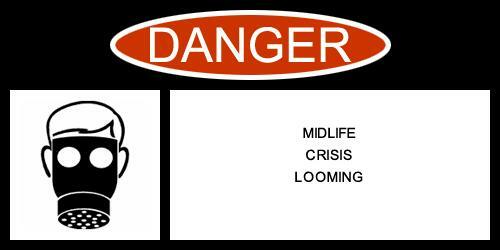 Or contingency, history, change? Are these two impulses as incompatible as they seem? I haven’t read enough of Rushkoff’s other work to know how (or whether) he works through this potential impasse. I am, however, intrigued enough to find out. From what little I have read, it’s clear that Rushkoff is an original, provocative thinker, so his intention to explore Biblical narratives with eye to splitting them open should be exciting to watch. 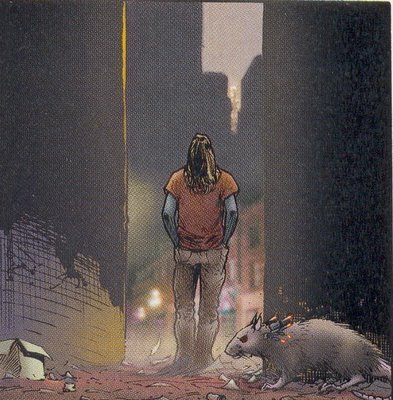 And I’m happy to report that the first issue of Testament is extremely promising. (It also looks fantastic thanks to Liam Sharp’s sumptuous Quitey-meets-Dillon pencils.) And oh, look. Is that one of Morrison’s rat biorgs from We3? Popimage has a nice preview of issue #1 for the unconvinced. 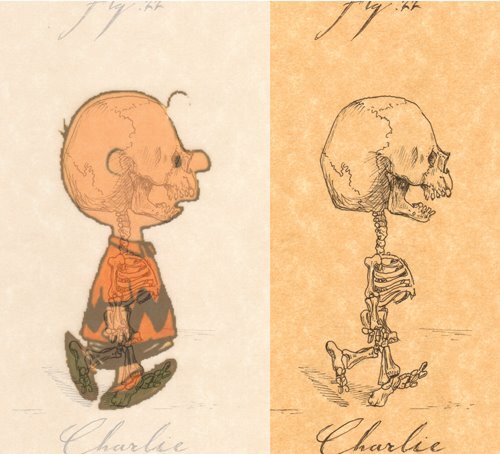 Artist Michael Paulus serves up cute/creepy Da Vinciesque x-rays of Hello Kitty, Shmoo, Pikachu, Betty Boop, Fred Flinstone, and the Peanuts gang, among others. My only question: where’s Bone? 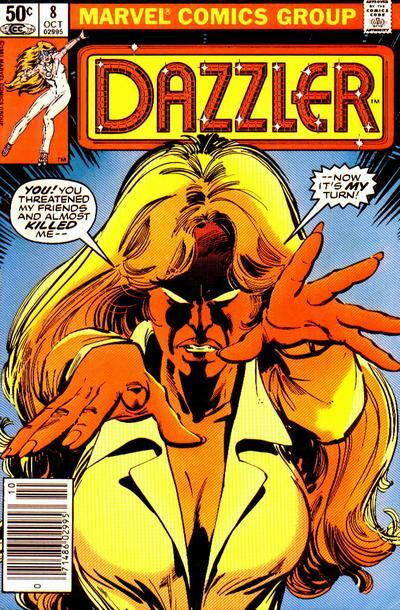 I’ve always suspected that you had a secret Dazzler obsession. I was worried about the movie adaptation, but who knows? I may be in a minority, but I actually like the trailers, especially the new one. The smart-looking V outfit reaffirms my (not terribly original) theory that the best “superhero” costume design is also the simplest and makes use of things that already have associations for us (eg. creepy Pierrot masks). 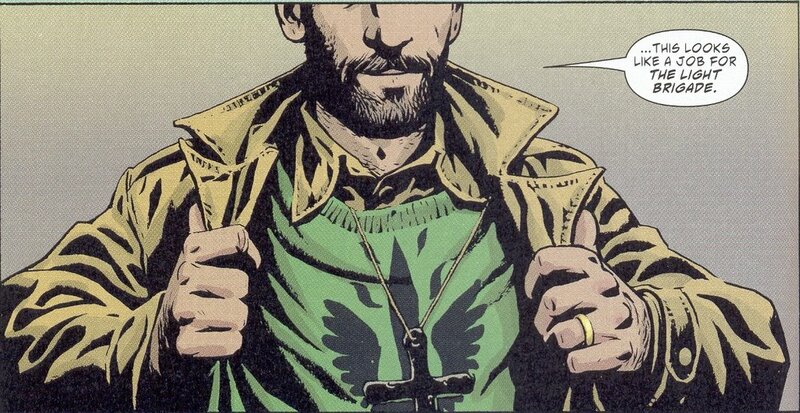 How prescient of Alan Moore and David Lloyd to have designed a costume that would allow filmmakers to remain true to the comic and still look awesome on screen. The posters ain’t too shabby either. 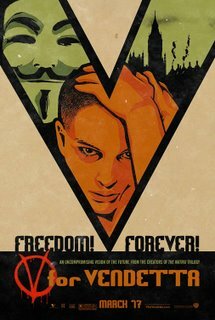 If you’ve already reread the story and can’t wait for the film (or even if you approach the premier date with dread) check out Marc Singer’s timely and astute analysis of V’s politics: V and Terror. These are also excellent reads, courtesy of Marc. 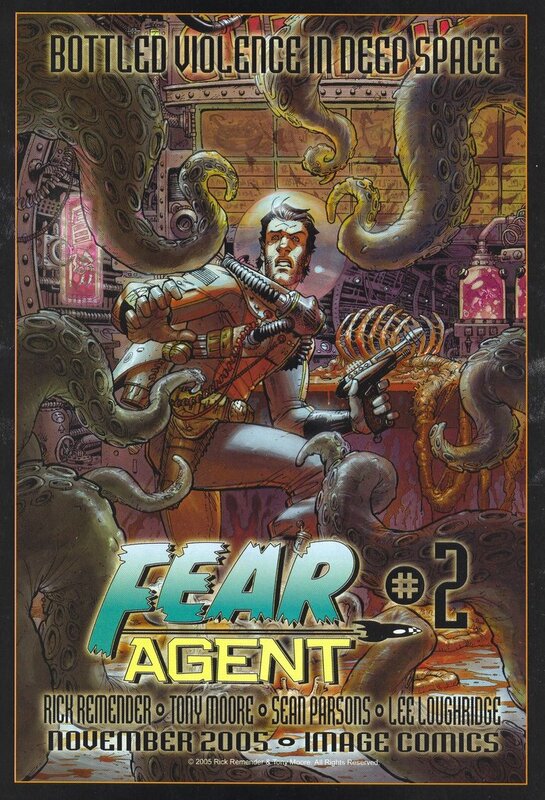 First GØDLAND, now Fear Agent. When did Image start producing such great books? 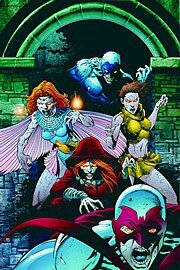 And if you aren’t enjoying Fear Agent yet, Mark Fossen provides you with two excellent reasons to try it right here. *Thanks to my dad for pointing this out! I dumped Miller and Lee’s rank Batman and Robin after issue #2, and Jack Cross won’t be missed either. But I do feel a little sorry about having to bid farewell to Waid and Kriston’s Legion. I’ve loved many incarnations of the Legion, and I’ve given this one a year to pull me in, but I think it’s time to admit that I’m just not enjoying it. 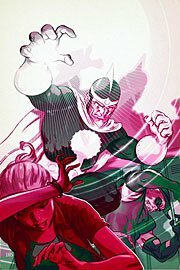 Waid has some clever takes on some of the characters, but the teenage revolution conceit feels surprisingly claustrophobic. The Legion I love is a giant soap opera set in a future where the canvas is huge and the story possibilities are wide open. This doesn’t feel like that. And I’m not sure why. All I know is that this book sits around for weeks before I force myself to read it. There have been bright spots in this new series: the dialogue is often witty and the letters pages have been cute. 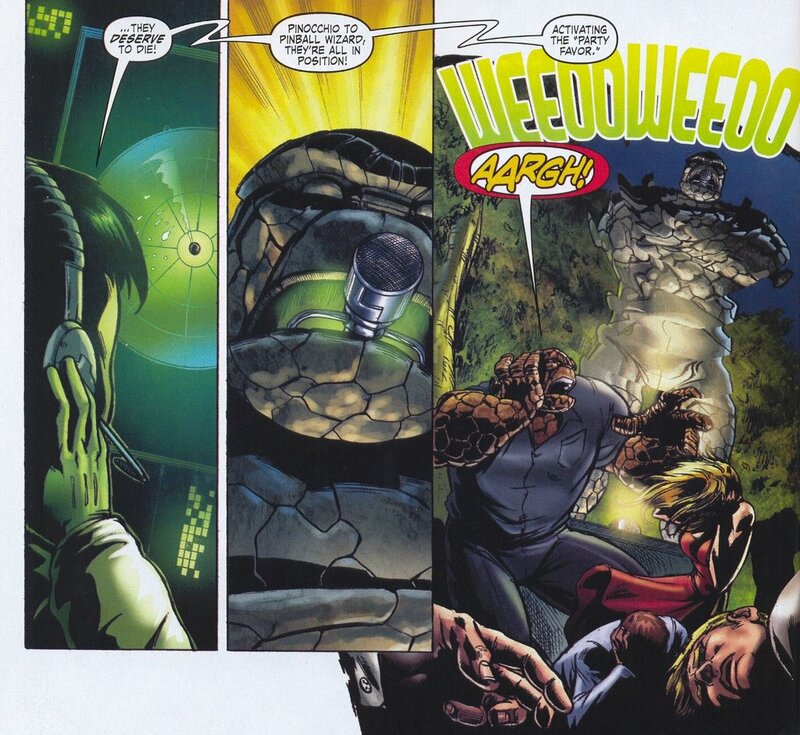 My favorite was that ingenious metafictional backup story drawn by Dale Eaglesham. Really Nice. But I need more than back-up bonuses to keep me around—unless, of course, the title of your book happens to be Outsiders, in which case I am unable to tear myself away from the carnage (see Rants, below). 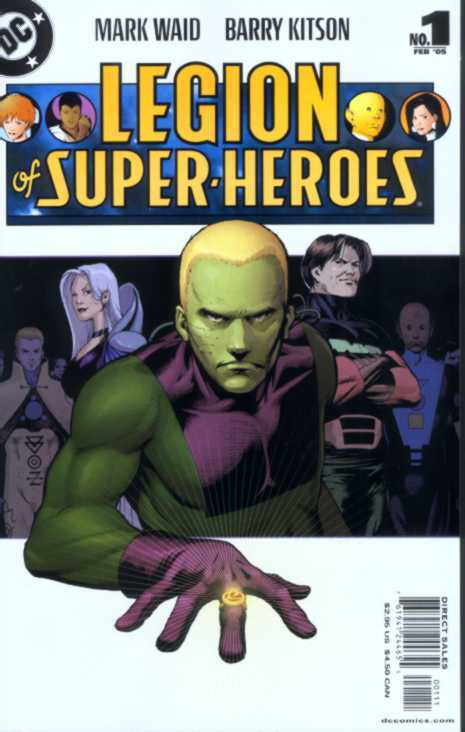 Sadly, the prospect of Supergirl and the Legion of Superheroes isn’t a selling point for me either. Till next time, Legion. Teen Titans Fanboy Geek-Out: The Return of Kole…and Amethyst? It had to happen sometime: Kole’s back. At the risk of offending her small but mighty fanbase, I have to say that Kole has always seemed like a silly, disposable character. 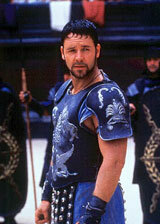 A second rate Terra who was designed to be killed in the original Crisis. Her only legitimate claim to fame is to have been drawn (exquisitely) by Jose Luis Garcia Lopez for a few glorious post-Perez issues of the New Teen Titans. But all those crystal barriers being shattered in Infinite Crisis, not to mention the battle between Jason Todd and Tim Drake in front of Kole’s statue in Teen Titans a couple of issues ago had me wondering if Kole wasn’t due for a resurrection. Now that it’s been confirmed by the latest issue of Teen Titans (I only learned later that it had been confirmed for readers of Previews some months ago), the interesting question is what Johns is going to do with her. As it happens, I have a humble, geeky suggestion. 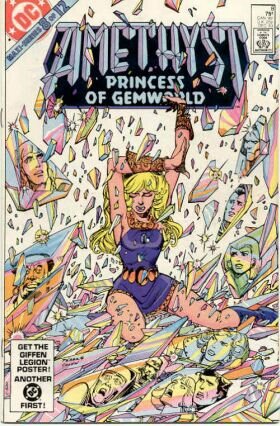 Now, given her powers and Johns’s love of continuity-tweaking, might Kole not provide the opportunity for an epic story centered around Amethyst and the characters of Gemworld? A Kole-Gemworld story might provide just the kind of insular mini-epic the Titans need. 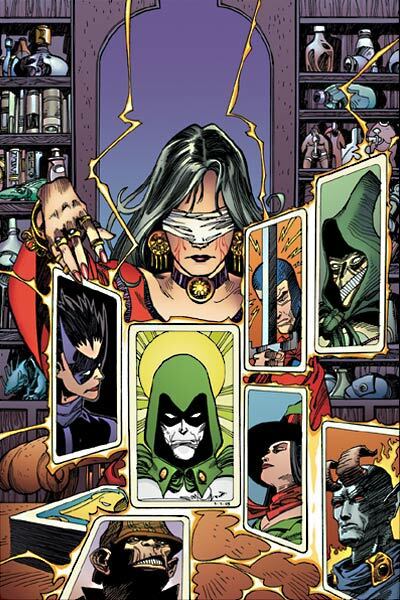 As I’ve mentioned before, I’ve been a bit disappointed with Johns’s Teen Titans, despite the success of the new series. There have been many nice moments here, but, in addition to the fact that the series needs a top-tier artist (I was looking forward to Ivan Reis, but it appears that that isn’t happening), the team really hasn’t gelled yet, and we’re almost two years in. 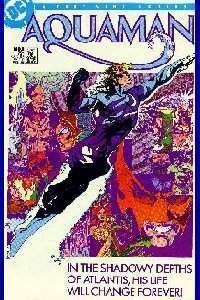 For me, the consolidating team-event of the Wolfman/Perez New Teen Titans was the epic Blackfire saga from NTT #23-Annual #1. This was a story on a huge scale that had sensational guest-stars (the Omega Men!) and a far-flung, exotic settings (Tamaran! Okaara! The Citadel!) where the Titans characters were really tested and team dynamics explored. The war-story had big stakes (both political and personal) and the effect was galvanizing (the crucible of battle and all that). 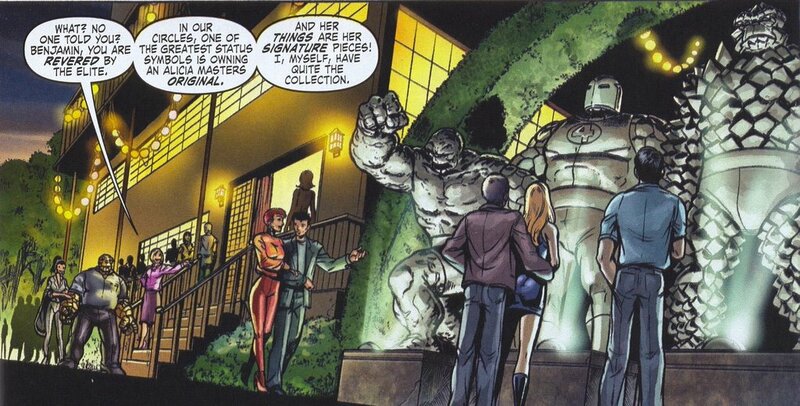 Now I’m no expert on Gemworld, and I don’t have any particular investment in Amethyst, but I do like the concept, and this setting has much fascinating potential as a sort of Tamaran for a new generation of Titans fan. 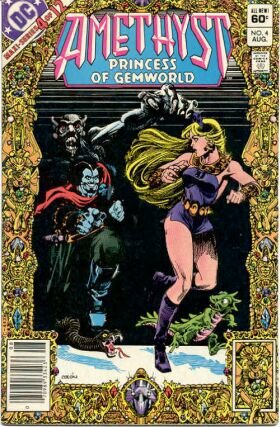 Moreover, this suggestion isn’t completely implausible since Geoff has had his eye on Gemworld for some time now in JSA—could some sort of Amethyst/Kole retcon be far behind? 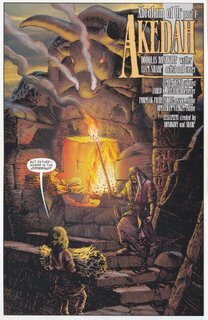 Btw: Why has Dan Mishkin, Gary Cohn and Ernie Colón’s beautiful original miniseries never been collected? 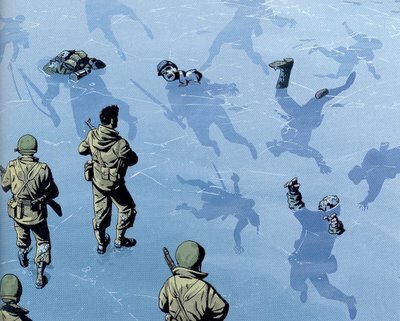 Chris Tamarri has recently written an eloquent essay on the Larry Young affair, entitled The Why, that turns, about halfway through, to a consideration of the motives behind comics blogging. Riffing off some sage comments by Tom Spurgeon, Chris notes, “when I’m writing something that I know many people are going to be able to read, I write differently, not necessarily in terms of style, but more in my attention to detail. I make sure that I dot my I’s and cross my T’s.” This is pretty close to the reason I started this blog. I like comics and I like writing, but I’m lazy. The exciting promise that someone might actually read what I write is a huge carrot to say the least. It gets me to the keyboard. By the same token, it sobers me into trying to write well. And yet, however much one might wish for “better” comics criticism in the blogosophere (and personally, I find little to complain about), there’s also something wonderfully liberating about the degree of laziness that “publication” through one’s own blog permits. Just as there’s no way I would have written the articles I did this past year if I had no public forum in which to post them, there’s no way I would have written them if they had to be utterly perfect and suitable for submission to a refereed academic journal either. The beauty of the comics blogosphere, for me, is precisely its flexibility about self-policing and quality control. To the extent that she provides us with a motivating spur, blog publication can be a harsh mistress. But she is still not as exacting as PMLA. Thank goodness. And while I’m getting all introspective, I would like to say a sincere thanks to everyone who stopped by and spent a few minutes slogging through my pop-philosophizing and nostalgic rambles in 2005. I started blogging because I wanted to write and because I wanted a place to work out my thoughts about my favorite pastime. I didn’t expect to discover such a friendly and generous community. 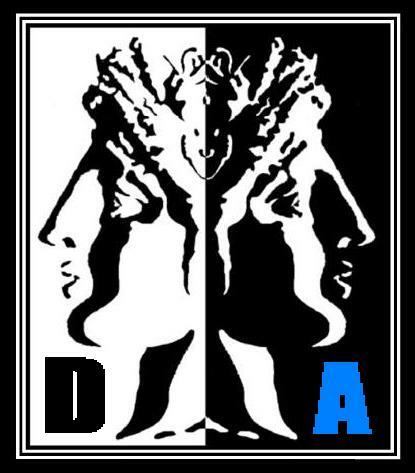 Thanks especially to Mark Fossen, Marc Singer, Ian Brill, Kurt Addams, Ragnell, Jog, Joe Rice, Brian Cronin, Jon Cormier, Nielalien, Shane Bailey, Greg Burgas, Jon Silpayamanant, Tom Bondurant, Disintegrating Clone, Chris Tamarri, and David Fiore for being so supportive of Double Articulation in 2005. Thanks also to everyone who has taken the time to leave a comment. I haven’t always been prompt about replying to them, but I deeply appreciate the time and thought that has gone into them. Happy New Year, one and all! The deadline for Chris Tamarri’s gift to everyone is January 15th. Time to start making the hard choices about a stellar year in comics. I’m really enjoying Judd Winick’s soapy Batman—and I praised his Green Arrow in the reviews section, above. Both are strong, entertaining reads. So why is Outsiders so excruciating? 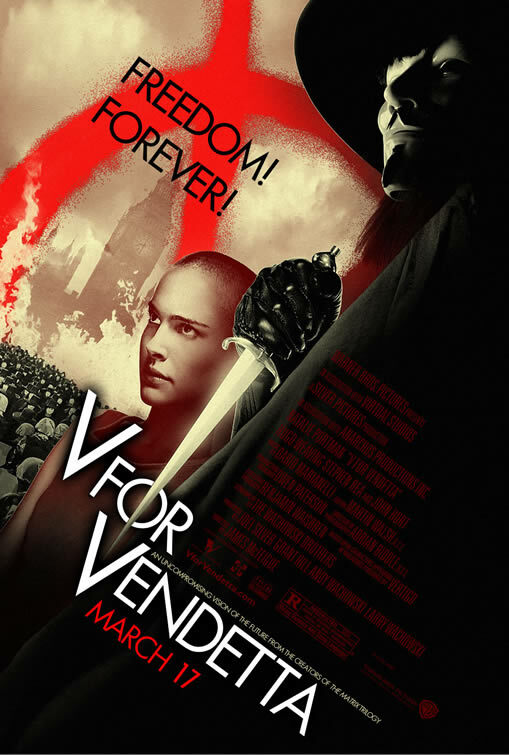 Since its inception, this title has been little more than a holding-pen for some potentially great characters, some terrible ones, a bunch of juvenile, half-assed thuggery, and a pastiche of too-cool-for-school dialogue that leaves me cold. In fact, nearly everything about this book misfires, despite the fact that many of the ideas themselves are potential home-runs, or at the very least base-hits. For example, the concept: A book that basically takes the adult Titans and mixes them in with a bit of the Batman and the Outsiders legacy. This was a great idea with a strong base to build on. The two teams have always had a close association: One was Robin’s Team, the other Batman’s and both rose to prominence during the heyday of the mid-eighties, even crossing-over at one point. 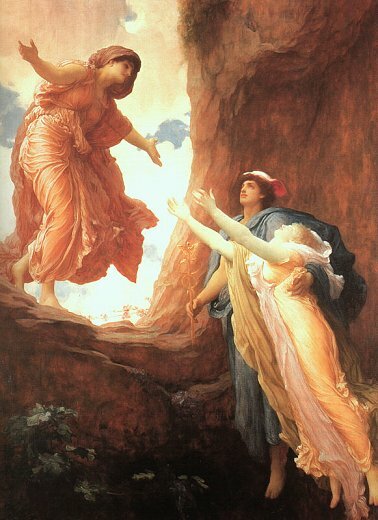 A wedding of the two books’ mythologies could have mined all sorts of interesting history. It was also a great opportunity to do what Geoff Johns did superbly on Flash: reinvigorate some of the coolest (but, for more than a decade, almost completely unused) villains in the DCU. The great thing about the Titans villains was that they were often genuinely scary: the original Brother Blood, Psimon and the Fearsome Five. 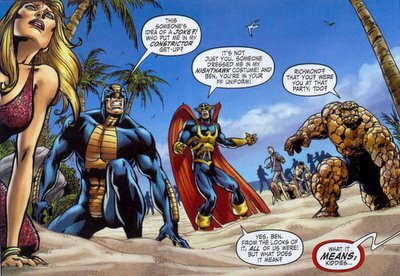 But Winick plays all these guys for laughs (I shudder to think what kind of trash-talking he’s going to have Blackfire do next month). Why, Judd? Why? 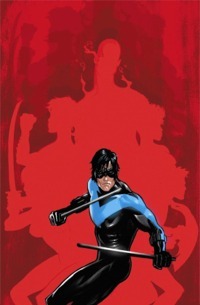 Another missed opportunity (and a related one) has been the reintroduction of Katana. I love the character (the wounded maternal samurai) and I was delighted to see her return, but so far Winick’s take on Katana makes me cringe. 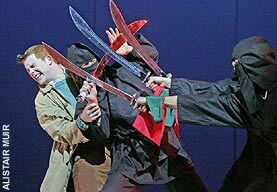 Yes, Katana was always lethal, but Mike W. Barr gave the character a maturity and depth that is totally absent from her current incarnation. Here’s hoping she ditches the Outsiders and ends up as one of Simone’s new Birds, One Year Later. I won’t even go into that breathtakingly awful America’s Most Wanted arc that still has me smarting. I mean, a photo cover of…John Walsh?!? Why am I taking quizzes designed by 14-year-olds? More importantly, why am I cheating? You are Captain Malcolm Reynolds, aka. Mal or Captain Tightpants. You saw most of your men die in a war you lost and now you seek solitude with a small crew that you are fiercely devoted to. You have no problems being naked.